Find out what makes Deirdre the Priestess tick in the next character history! Bells rang out, signalling the end of morning meals. The acolytes throughout the courtyard began to line up and ascend the steps into the temple under the watchful eyes of the elder priests and priestesses. One acolyte was absent. “Where under the sun and moon is that child?” breathed the head priestess with exasperation. She looked out to the courtyard, “Always late for her lessons. Always a mess when she does show up. I suppose we will find her watering flowers out on the hills before sup- Goodness child!” The priestess hiked up the hem of her robe and rushed down the steps to the courtyard gate. “This poor ox had broken his leg and was stuck in the mud and I had to pull him out or he would have sunk in but I was not strong enough and with his leg broken he could not help me and so I tried the spell from last week and he got up but I do not know who he belongs to or if the spell will last…” She seemed to rattle on breathlessly, nearly in tears, as she thought about her spell failing and the ox’s leg breaking again. The few occasions that Deirdre was on time to her lessons, her instructors could not wish for a better pupil. But the young elf often found herself with far more pressing problems to attend to than her lessons. A songbird’s injured wing, a cow giving birth to a calf, a farmer suffering a cold, or a steer’s twisted ankle. There seemed to be an endless number of problems surrounding the monastery that needed the young priestess’ attention and she made it a point to visit each and every one of them before the sun set. It was all of these selfless acts of kindness that earned her the attention of the Goddess. It became apparent to all of her sisters and brothers amongst the temple that Deirdre was one of the few true Gifts of the Goddess. A chosen vessel blessed with healing talents and unending kindness. The alacrity with which she came to master the spells and rituals for easing pain, regenerating limbs, or even breathing life back into the dead was stunning. The fact that she could do these things miraculously, through force of will alone, was enough to convince the temple that Deirdre was something more, and everything was in motion for her ascension to high priesthood. Unfortunately for Deirdre’s superiors in the order, she had other things in mind. Deirdre had no desire to be a theocrat, to spend her days in her cloister passing out notes and well wishes or attending to religious ceremonies. Deirdre found her faith in engaging individuals, seeing to it that she could share her gifts with the people who needed them most. She had no special reverence for one patient over another, equally satisfied with mending a horse’s split hoof as she was regenerating a king’s lost leg. The most important thing to Deirdre was the safety and well being of the others around her. As a result, she found herself spending ever increasing amounts of time tending to adventurers. Adventurers were a rare breed of folk who were always capable of surprising Deirdre with new ways to maim themselves. But they were almost always people who did good, even if their motivations may have been more self-centered than her own. While they sought glory and riches, they also did great services to communities around the world. Slain dragons and routed goblin warbands meant safe villages and better lives for the farmers and folk who lived in them. She spent decades working with them, tending to their wounds, hearing their stories, and even allowing herself to be recruited on the odd quest. Deirdre traveled far and wide, visiting temples throughout the land. As the decades of pilgrimage grew into centuries, stories of her kindness and talent began to precede her. She was welcomed by generations of the faithful, and respected even among those who held patronage to other deities. None were more happy to receive her than the marvelous Temple of Greyport. She made it a point to visit every year. There was a second reason that she loved to visit Greyport: the Mage’s Collegium. She would always try to arrive in time for the Collegium’s annual expedition, when the young mages at the Collegium would experience adventure, and often injury, for the first time. Deirdre attended as many of the expeditions as she could, talking with the students, inquiring about their hopes and dreams, and doing what she could to point them on a good path. She was sure to remember each and every one of them, since she knew many of them were likely to become adventurers. 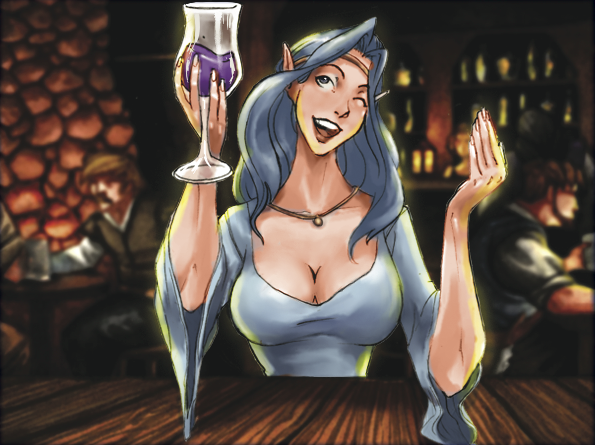 Deirdre was present on the Day of Wyrm Fire that wrought Greyport’s downfall. The temple was the beast’s target when it descended from the mountains. A roaring inferno followed the beast’s line of attack as it crashed into the Temple, crushing the steepled roof and dropping its towers. The priests were sent into disarray, and it was all Deirdre could do to ensure her brothers and sisters escaped the inferno while the clerics and paladins fought back. She was witness when the shield surrounded the Collegium and beast’s advance was halted. And she was witness also as the dragon’s fury and rage was taken out upon the rest of Greyport. It took the concerted effort of the remaining members of the Temple, Collegium, and resident adventurers to finally drive the foul beast off. When the dragon’s attack ended, more than half of the city was still ablaze. Deirdre worked tirelessly, assisting the refugees who had lost their homes. The day had left a lasting impression on Deirdre and, in the years that followed, she continued to visit Greyport and offer what assistance she could. But the Temple had been destroyed, and her brothers and sisters had forsaken the city, leaving her alone to do what she could. Even Deirdre could not prevent the people of Greyport from falling into despair.